Facts you never knew about stationery! Office stationery is the last thing you’d expect to exciting, or interesting. At least 25% of people in the United Kingdom work in an office environment and stationery can often get overlooked and we don’t realise how important it is to work productivity. Here are some interesting facts about stationery, which might make that dreary office day a little bit more exciting. -Did you know that you could be holding a killer in your hand? The pen cap is revealed to be the cause of 100 deaths on average every year through people choking on them. People often chew on the lip without realising that it could fall into their mouth at any moment and cause asphyxiation. For this reason, pen lids now have holes in the top that has lowered the mortality rate and prevents choking. You might want to think about that next time you get bored and decided to have a good chew. -Edward Naime is responsible for the creation of the eraser. In 1770, he accidentally picked up a rubber and discovered its erasing qualities. This may not seem that interesting, but did you know that before 1770, people would use bread without the crust to erase pen and pencil mistakes? It is advised that you don’t use your lunch if you haven’t got a rubber at hand. -Like the rubber, the post-it note was also discovered by accident. When trying to make a strong adhesive, 3M employee, Spencer Silver, produced a weak adhesive that would not leave a residue when peeled off. In 1977, this led to the creation of the post-it note and ever since, it has been a vital piece of office stationery to jot down important notes. -Ball point pens are another essential piece of office stationery, but how did it become so popular? During World War II, fighter pilots needed a pen that would not leak at high altitudes, which was the case for the fountain pen. The pen was invented by a Hungarian newspaper printer called László Bíró who used the ink that was employed in printing newspapers. He found that the ink dried faster leaving the paper smudge free. -We use printers every day and the earliest form of printing dates back to 220AD China, where they would use woodblock to distribute text, images and patterns. Until the invention of the printing press in Europe in the 15th century, this was one of the main techniques of printing all over the world. -It may seem like a modern invention, but the stapler was actually invented in 18th Century France by King Louis XV. He had each staple designed with the insignia of the Royal Court. With the growing use of paper in the 19th century, there was a demand for paper fasteners that were efficient and hold together more paper. Now that you know these interesting facts, you may realise how important stationery is for the office environment and beyond. 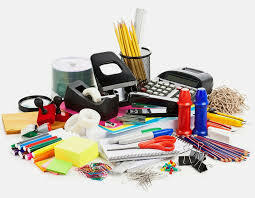 For all your stationery needs, you should contact an office stationery supplier who can cater to not only office stationery, but safety equipment and electronics too. Courtney is an up and coming blogger who has an interest in writing, amateur dramatic and spends his free time playing video games and travelling.